Seahawks fullback Derrick Coleman visits Staff Sgt. Carrion along with other service members at JBLM’s Madigan Army Medical Center. Merry Christmas! 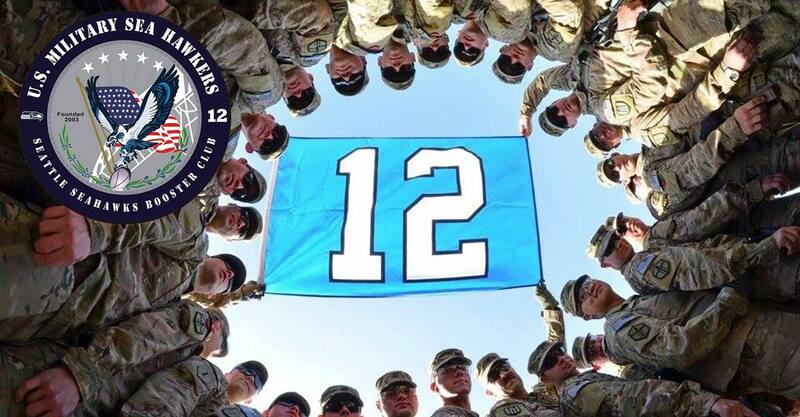 We just got word that the Seahawks have six sideline passes for our Military Sea Hawkers club for the game against the Rams. If you have tickets for the game and haven’t had the chance to spend pregame in the south end zone prior to kickoff, send an email to military.seahawkers@gmail.com and we’ll randomly select some lucky members. Be sure to include how many members are in your party and if they are also military. There was also some exciting news from the team this week that they are locking up some more members of this young defense. Linebacker K.J. Wright and defensive end Cliff Avril each signed extensions to be with the team for four more years. Seattle has more remaining cap space than almost the entire NFL, so there is still plenty of room for guys like Russell Wilson and Bobby Wagner. Their first chance to negotiate an extension will come in the offseason. The Seahawks 17-7 win over the 49ers on Sunday has Harbaugh looking for work in the college ranks. Rumors are that he’s seriously considering heading back to his alma mater, Michigan. The thing about San Francisco now is that it’s going to be hard to find a coach who is as much fun to dislike as Harbaugh. The Seahawks defense continues to dominate. They’ve only given up three touchdowns over the last four games. Combine that stat with the fact that this week’s opponent, the Arizona Cardinals, have only score three touchdowns over that same stretch. The Cardinals starting quarterback, Ryan Lindley, has yet to throw a touchdown pass in the NFL and has seven interceptions in his three season. The way things are aligning it has people wondering if Seattle could repeat a feat they performed last year — to go into the venue of the upcoming Super Bowl and shut out the home team just like they did last year in New York. It’s also good to know that Seattle is 12-1 in primtime games under Coach Carroll. One reason that could cause concern is that this Cardinals team hasn’t needed strong quarterback play all season. They’ve relied on special teams and defense to put them in great field position and only need short drives. They’ve also been able to have much more success with backup running back Kerwynn Williams after Andre Ellington went down to injury. We should know by kickoff if this win will put Seattle into the playoffs. A loss by Green Bay, Detroit, or Philadelphia could make this a win and in game. A Dallas win combined with an Eagles loss could put Seattle in the playoffs before the game even starts. No matter what happens from other teams, two straight wins by Seattle ensures they’ll get a bye and be playing at home for the first round of the playoffs. And now we’re up to seven! Seven straight weeks of Seahawks action on AFN and DTS. Of course this was expected since it’s a primetime Sunday Night Football Game. The game is scheduled to show on AFN and DTS Sports at 1720 PT, 0120 GMT and 0550 in Afghanistan. If you enjoy the show, please subscribe via iTunes, Stitcher, TuneIn or other favorite podcasting app.